Renowned for its stability and durability, Goalrilla basketball hoops are a prudent and worthwhile investment for players of all experience levels. 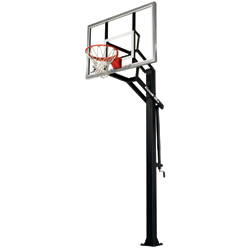 JumpUSA offers the Goalrilla GS-in-ground basketball hoop, which features a 54�� tempered glass backboard. Players have the ability to move the hoop up or down, starting at 7 �� and ending at 10�, ensuring that players of all ages can enjoy the beautiful game of basketball. The hoop is easy to install and thanks to the accompanying anchor bolt mounting system, it�s easy to relocate to a different place if you move to a new home or you simply want to move the hoop to a different place on your property. Read below to learn more about the many benefits of the Goalrilla GS-III.